Cars are a symbol of modernity and luxury, and particularly so in China, the largest car market in the world. Everyone is in on this: the government, auto companies, and of course, the sacred cow of the international economy, the rising Chinese middle class. 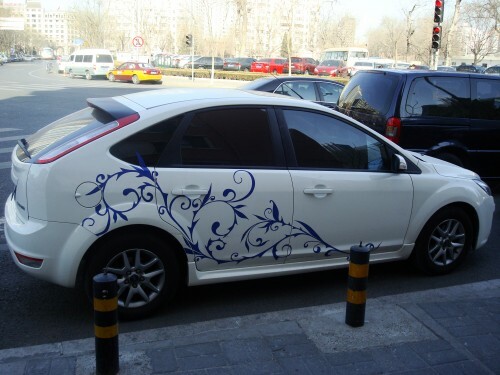 As a country and a generation goes wheels up, one of the greatest, quirkiest things that can be seen in Beijing is the wildly varied ways that people decorate their cars. This is only a small selection of the cars that can be seen in Beijing. 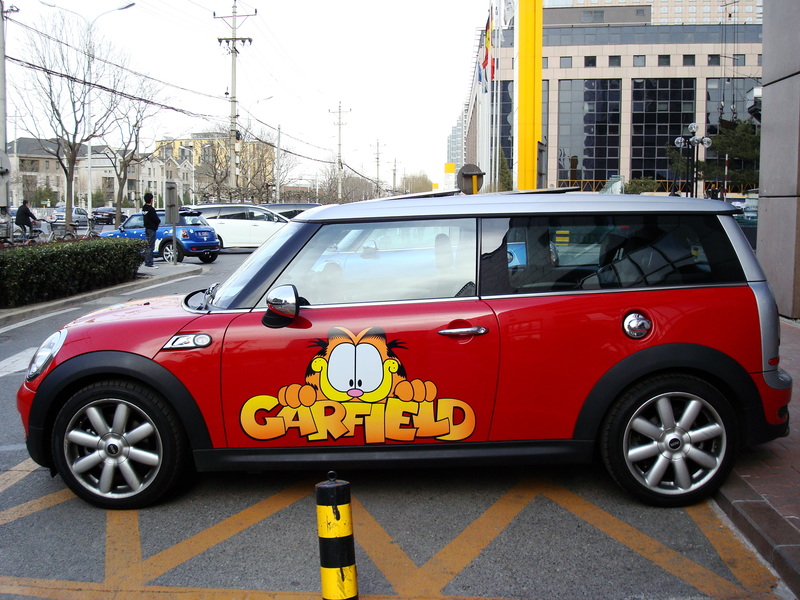 Some of the best ones, like the cotton candy pink Hello Kitty car, or the crazy Tarepanda one, I did not manage to snap in time, but they haunt the streets and traffic jams of this car-mad city. 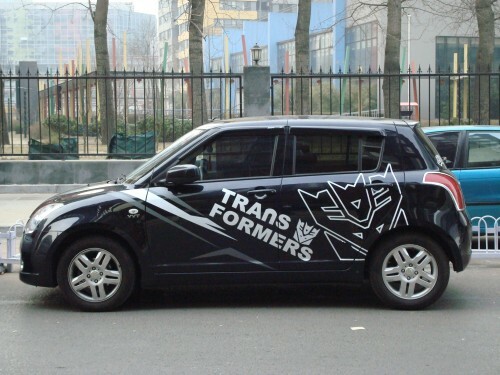 This car is guaranteed to transform, or your money back! False information! 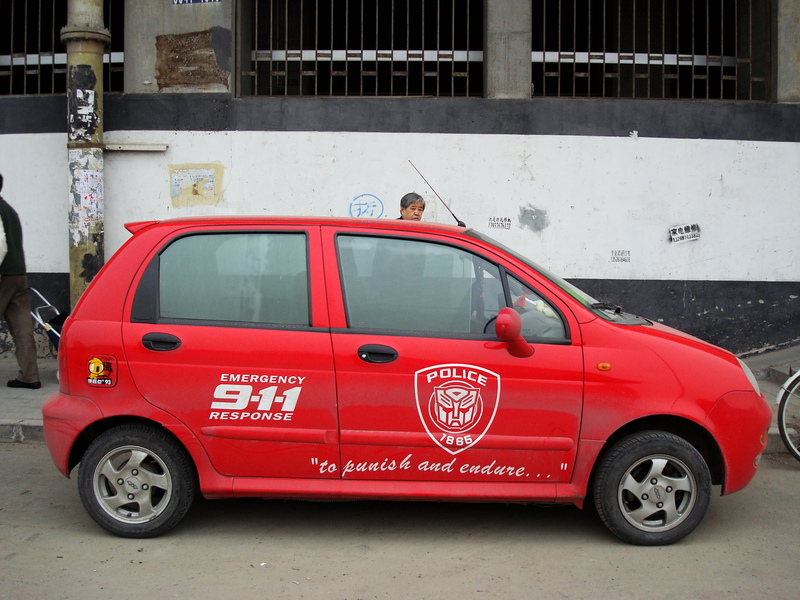 You should actually call 110! 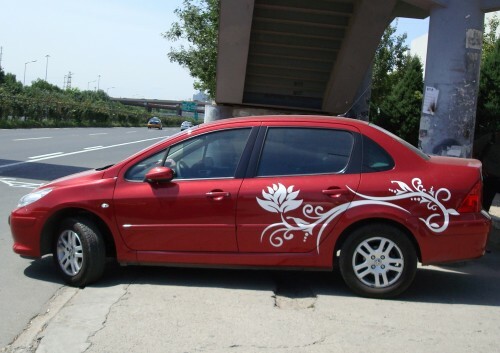 Let a hundred flowers bloom on the cars of China. I actually had a very similar wall decoration. Bright and cheery, perfect for shopping. 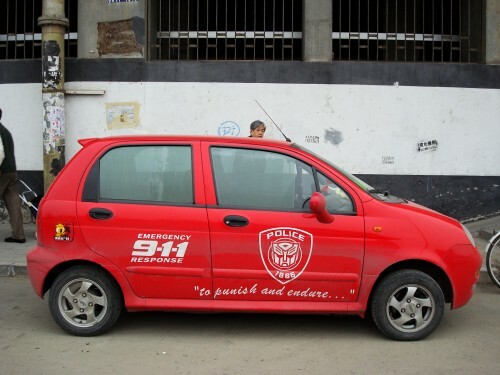 This car is trying very hard to be a Mini. Here’s an actual Mini from the dealership at the Lufthansa Center. Saved the best one for last. 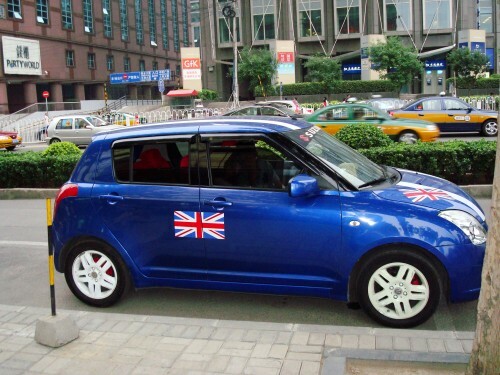 Here is the ultimate China ride: The Mao Mobile! (Thank you, Sarah, for this amazing pic.) I’m not sure the other two are, can’t quite make out the faces in the picture, although it looks like it could be Zhou Enlai in the middle. The characters read: 10,000 years to citizens of China; 10,000 years to the Communist Party. If you want more fabulous cars, Flickr is your friend. 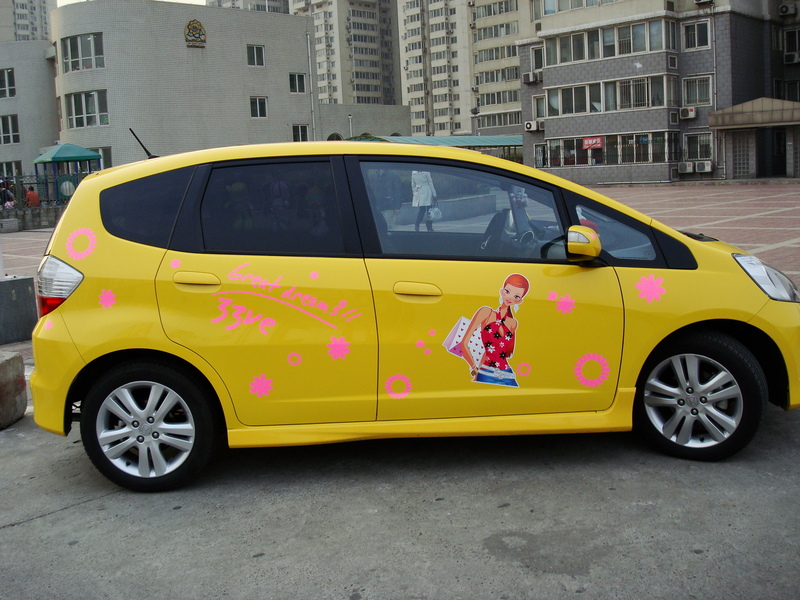 Check out the Hello Kitty cars (one, two) this floral extravaganza, and this imperial one, perfect for China’s little emperors. 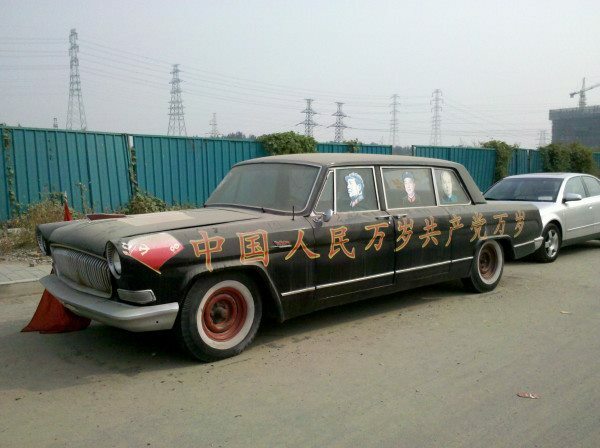 2 Comments on "Pimp my ride, China-style!" Hi, not sure if you check comments here anymore but you don’t have a contact link! Thanks for some of your posts on what’s interesting in Beijing. I’m actually originally from Beijing and I’m visiting it in December. I’m curious to rediscover my old city so can you recommend me some under the radar events that locals actually go to? Searching for some options, the first result was a recent police raid in Sanlitun. « Did China invent the restaurant?